You can use this life cycle craft during your science lessons, and they work well for science centers too. This spring life cycle can be used throughout the year too in addition to spring. 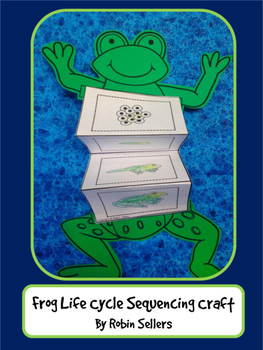 The life cycle of a frog craft includes a picture of the final frog life cycle craft, assembly pictures of the frog life cycle craft, assembly directions, a printable frog life cycle poster, a printable frog life cycle craft pattern, and two versions of frog life cycle sequencing cards (there are four stages for the frog life cycle) to paste on the craft pattern. 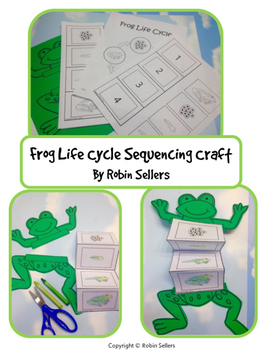 You can use this life cycle craft as an introduction to your science lesson or as a frog life cycle assessment. If you wish, you can also find my the life cycle of a pumpkin, life cycle of a frog, life cycle of a flower, life cycle of a plant, life cycle of a chicken, life cycle of a butterfly, or the water cycle in a BUNDLE HERE.